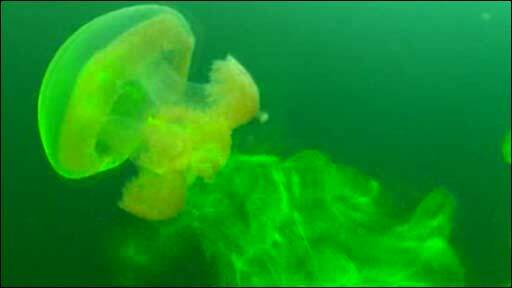 Jellyfish help to stir up the ocean as they move, researchers have found. Using a green dye, scientists showed how the animals' umbrella-shaped bodies were a key factor in this mixing. The distribution of heat, nutrients and chemicals helps maintain the marine environment and has an important influence on global climate. Reporting in the journal Nature, the researchers said that marine animals of many shapes and sizes contributed to ocean turbulence. Charles Darwin, grandson of the famous British naturalist, first discovered that animals stir up the oceans more than 50 years ago. The influence of this "biogenic" or "Darwinian" mixing on the ocean environment has been under debate since then. The wind and tides play a big part in mixing the oceans, but this study suggests that the role of biogenic mixing could be more significant than previously thought. The research showed how small creatures - as well as very large sea mammals - create turbulence. "This is important because the other proposed mechanism was simply that large animals stirred up the water as they swam," explained lead author John Dabiri from the California Institute of Technology (Caltech). He and his colleague Kakani Katija showed exactly how jellyfish, which were between one and 10cm in diameter, "dragged water around" as they moved, demonstrating the effect by squirting a dye in front of the creatures. But, Dr Dabiri explained, the jellyfish were unlikely to be the "primary ocean mixers". "Crustaceans - like copepods and krill - are likely the primary biogenic mixers, because there are so many of them," he explained. "We used jellyfish here, because of their uniform shape - and because they were relatively easy to study." The principle behind the effect, Dr Dabiri explained, was aerodynamics. "When the animal is at depth, it will carry some of the colder, deeper water with it as it migrates upwards," he said. "The shape of the animal is important, because the more streamlined it is, the less of a disturbance it causes. So a bullet-shaped animal will carry less water with it than a flatter, saucer-shaped animal." 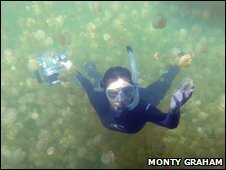 Jonathan Sharples, principal researcher from the UK's Proudman Oceanographic Laboratory told BBC News that this mechanism was likely to be important in specific areas where there was a high density of marine life. "In warmer surface water there are virtually no nutrients, and the transport of nutrients from the bottom water is very important for the single-cell plants that live there," he said. The next step, Dr Dabiri said, was to find out where in the ocean, the phenomenon of biogenic mixing has the biggest effect.